One of the newer sauces from CaJohn’s is their Quetzalcoatl Hot Sauce. Essentially an update to their long-time favorite, Oaxacan, this sauce ups the ante in chile peppers and heat. Voted “Best New Product” at the 2012 Jungle Jim’s Weekend of Fire by the bloggers in attendance, Quetzalcoatl lives up to the quality and fiery goodness that CaJohn’s has always been known for. If you found this review by searching for “Quetzalcoatl” – you are indeed ahead of the game. The pronunciation of “quetzalcoatl” is questionable at best, let alone spelling it correctly. But as best as I can fathom, it is pronounced “k?t – zal – coat’ – al”. A taco-style Oaxacan hot sauce that pays tribute to both the bold spirit of the Aztec warriors and those willing to sail half-way around the world to reveal their secrets. Appearance: – Medium to light bodied and dark, with flecks of seasonings, there is an ever so slight pulpiness to it. Enough of a body to keep it contained on a spoon. This is a very pungent sauce that just screams for tacos, chili, eggs, and nachos. And of course, pizza. Aren’t most hot sauces good on pizza? Taste straight up: – Vinegar flavor is up front, but muted, followed my the unmistakeable cumin/chili flavor (the meat, not the pepper). In between you get a mild to medium heat level. Heat Level: – On the plus side of Mild to Medium, this has a nice, satisfying heat – it does not hurt, but rather is just what an everyday hot sauce should be. On food: We spooned this sauce over nachos for this review, and they were warm, inviting, flavorful and delicious. Overal Rating and Final Thoughts: – – Big flavor, nice heat, great mouth feel. This is an everyday sauce that would go well on just about everything. In addition to the Original Oaxacan Hot Sauce, CaJohn’s offers a 4 pack of Oaxacan Original, Chipotle, Habanero, and Ghost pepper – buy the four pack here. 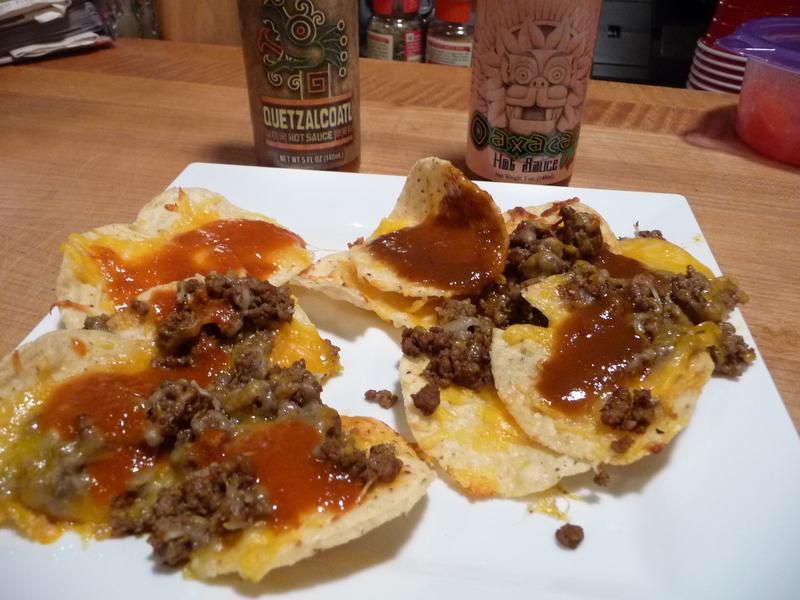 Nachos with Quetzalcoatl on left, Oaxacan on right. A feathered serpent deity worshipped by many different ethno-political groups in Mesoamerican history. Appearance: – Still the same medium to light bodied sauce, but with a bigger, brighter red color. The pulp is still there too. Nice texture. Taste Straight Up: – Same great chili flavor with the nice mild base of vinegar. Stand by for a HUGE hit of heat, though. The Serrano peppers almost get lost here, as the Ghost chiles will light you up. With a full mouth burn, small as it is, this stuff is hot. 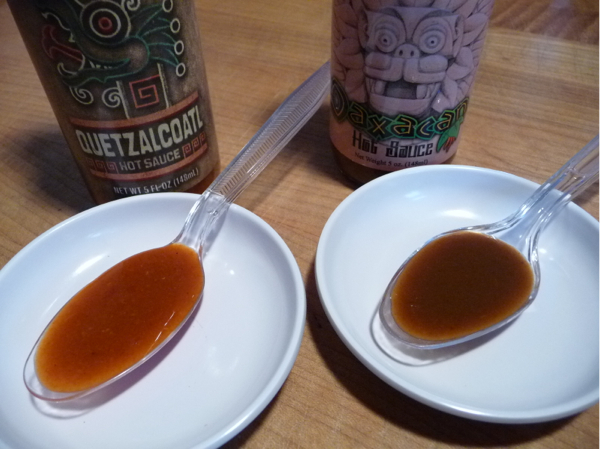 Heat Level: – Wow, what a difference between the Original Oaxacan and this Quetzalcoatl sauce. The heat really lingers. This is not for the tame chilehead mouth. It really rocks with heat. You have been warned. On Food: Once again, nachos were the food of choice here, and the Quetzalcoatl sauce did not disappoint. Yup, it’s still hot, but just a bit subdued after heating. The overall flavor still stands strong, so the biting but short lived fiery heat is almost an afterthought. Overall Rating and Final Thoughts: – 3 1/2 Stars because it is so freakin’ hot. Granted the heat does NOT LAST LONG, but boy is it a searing heat. Be sure and visit CaJohn’s for these and tons of other CaJohn’s products for you and the Chilehead in your family. And tell them HotSauceDaily.com sent you! You know what? The more I ate of it, the less the burn “hurt”. Flavor trumped the heat ultimately. Just put in an order for these and two other CaJohns sauces. Looking forward to it. Awesome, Jeff. You won’t be disappointed in the flavors. -avez-vous connu Marguerite Gautier ?